Commission Regulation (EC) No 152/2009 (2) includes methods for the determination of the levels of polychlorinated dibenzo-p-dioxins (PCDDs), polychlorinated dibenzofurans (PCDFs), dioxin-like polychlorinated biphenyls (PCBs) and non-dioxin-like PCBs in feed. EU reference laboratory for dioxins and PCBs in feed and food has provided evidence that analytical results for dioxins and PCBs in certain cases are not reliable when the performance criteria provided for in Part B of Annex V to Regulation (EC) No 152/2009 are not applied by laboratories performing the analysis of samples taken by feed business operators in accordance with Regulation (EC) No 183/2005 of the European Parliament and of the Council (3). It is therefore appropriate to make the application of the performance criteria for the analysis of samples obligatory. Given that the method of using a decision limit to ensure, with a certain probability, that an analytical result is above the maximum level, as provided for in Commission Decision 2002/657/EC (4), is no longer applied for the analysis of dioxins, furans and PCBs in feed, it is appropriate to delete that method and to keep only the method of the expanded uncertainty using the coverage factor of 2, which gives a level of confidence of approximately 95 %. Guidance documents for the measurement uncertainty and for the estimation of the Limit of Detection (LOD) and Limit of Quantification (LOQ) have been developed. It is appropriate to make reference to them. In line with the reporting requirements for bioanalytical screening methods provided for in Part B of Annex V to Regulation (EC) No 152/2009, it is appropriate to provide also for physico-chemical methods, to be used for screening, specific reporting requirements in Chapter II of that Part. Given that the analysis of dioxins, dioxin-like PCBs and non-dioxin-like PCBs are in most cases determined together, it is appropriate to align the performance criteria for the non-dioxin-like PCBs provided for in point 3.3 of Chapter III of Part B of Annex V to Regulation (EC) No 152/2009 to the performance criteria for dioxins and dioxin-like PCBs. This is a simplification without substantial changes in practice as for non-dioxin-like PCBs the relative intensity of qualifier ions compared to target ions is > 50 %. Following experience gained, it is appropriate to adapt some technical specifications such as recoveries of isotope-labelled standards provided for in points 7.3 and 7.5 of Chapter III of Part B of Annex V to Regulation (EC) No 152/2009. Furthermore, there are several other minor modifications proposed to the current provisions to improve the consistency in the terminology used, requiring replacing the whole Part B of Annex V to Regulation (EC) No 152/2009 to maintain the readability of the text. Regulation (EC) No 152/2009 should therefore be amended accordingly. Part B of Annex V to Regulation (EC) No 152/2009 is amended in accordance with the Annex to this Regulation. Done at Brussels, 3 May 2017. (2) Commission Regulation (EC) No 152/2009 of 27 January 2009 laying down the methods of sampling and analysis for the official control of feed (OJ L 54, 26.2.2009, p. 1). (3) Regulation (EC) No 183/2005 of the European Parliament and of the Council of 12 January 2005 laying down requirements for feed hygiene (OJ L 35, 8.2.2005, p. 1). (4) Commission Decision 2002/657/EC of 14 August 2002 implementing Council Directive 96/23/EC concerning the performance of analytical methods and the interpretation of results (OJ L 221, 17.8.2002, p. 8). The samples intended for the official control of the levels of polychlorinated dibenzo-p-dioxins (PCDDs), polychlorinated dibenzofurans (PCDFs), dioxin-like polychlorinated biphenyls (PCBs) (1) and non dioxin-like PCBs in feed shall be taken in accordance with the provisions of Annex I. The quantitative requirements in relation to the control of substances or products uniformly distributed throughout the feed as provided for in point 5.1. of Annex I shall be applied. Aggregate samples thus obtained shall be considered representative for the lots or sublots from which they are taken. Compliance with maximum levels laid down by Directive 2002/32/EC shall be established on the basis of the levels determined in the laboratory samples. For the purposes of this Part B, the definitions laid down in Annex I to Commission Decision 2002/657/EC (2) shall apply. “Screening methods” means methods used for selection of those samples with levels of PCDD/Fs and dioxin-like PCBs that exceed the maximum levels or the action thresholds. They shall allow a cost-effective high sample-throughput, thus increasing the chance to discover new incidents with high exposure and health risks to consumers. Screening methods shall be based on bioanalytical or GC-MS methods. Results from samples exceeding the cut-off value used to check compliance with the maximum level shall be verified by a full re-analysis from the original sample using a confirmatory method. “Confirmatory methods” means methods that provide full or complementary information enabling the PCDD/Fs and dioxin-like PCBs to be identified and quantified unequivocally at the maximum or in case of need at the action threshold. Such methods utilize gas chromatography/high resolution mass spectrometry (GC-HRMS) or gas chromatography/tandem mass spectrometry (GC-MS/MS). The lot or sublot complies with the maximum level if the analytical result for the sum of PCB 28, PCB 52, PCB 101, PCB 138, PCB 153 and PCB 180 (hereafter referred to as non-dioxin-like PCBs) does not exceed the maximum level laid down by Directive 2002/32/EC, taking into account the expanded measurement uncertainty (3). The lot or sublot does not comply with the maximum level as laid down by Directive 2002/32/EC, if the mean of two upper-bound (4) analytical results obtained from duplicate analysis (5), taking into account the expanded measurement uncertainty, exceeds the maximum level beyond reasonable doubt, i.e. the analysed concentration after deduction of the expanded measurement uncertainty is used to assess compliance. The expanded measurement uncertainty is calculated using a coverage factor of 2 which gives a level of confidence of approximately 95 %. A lot or sublot is non-compliant if the mean of the measured values minus the expanded uncertainty of the mean is above the maximum level. The rules, mentioned in the paragraphs above under this point, shall apply for the analytical result obtained on the sample for official control. In case of analysis for defence or reference purposes, the national rules shall apply. performed by a confirmatory method, does not exceed the respective maximum level of PCDD/Fs and the sum of PCDD/Fs and dioxin-like PCBs laid down by Directive 2002/32/EC, taking into account the expanded measurement uncertainty. For screening assays a cut-off value shall be established for decisions on sample compliance with the respective maximum levels set for either PCDD/Fs, or for the sum of PCDD/Fs and dioxin-like PCBs. The lot or sublot does not comply with the maximum level as laid down by Directive 2002/32/EC if the mean of two upper-bound (6) analytical results obtained from duplicate analysis (7) using a confirmatory method, taking into account the expanded measurement uncertainty, exceeds the maximum level beyond reasonable doubt, i.e. the analysed concentration after deduction of the expanded measurement uncertainty is used to assess compliance. The sum of the estimated expanded uncertainties of the separate analytical results of PCDD/Fs and dioxin-like PCBs shall be used for the sum of PCDD/Fs and dioxin-like PCBs. Action thresholds serve as a tool for the selection of samples in those cases where it is necessary to identify a source of contamination and to take measures for its reduction or elimination. Screening methods shall establish the appropriate cut-off values for selection of those samples. Where significant efforts are necessary to identify a source and to reduce or eliminate the contamination, it is appropriate to confirm exceedance of the action thresholds by duplicate analysis using a confirmatory method and taking into account the expanded measurement uncertainty (8). The requirements set out in this Chapter shall be applied where feed is analysed for the official control of the levels of 2,3,7,8-substituted PCDD/Fs and dioxin-like PCBs and as regards sample preparation and analytical requirements for other regulatory purposes, which includes the controls performed by the feed business operator to ensure compliance with the provisions of Regulation (EC) No 183/2005 of the European Parliament and of the Council (9). The goal of screening methods is to select those samples with levels of PCDD/Fs and dioxin-like PCBs that exceed the maximum levels or the action thresholds. Screening methods shall ensure cost-effective high sample-throughput, thus increasing the chance to discover new incidents with high exposure and health risks of consumers. Their application shall aim to avoid false-compliant results. They may comprise bioanalytical and GC-MS methods. 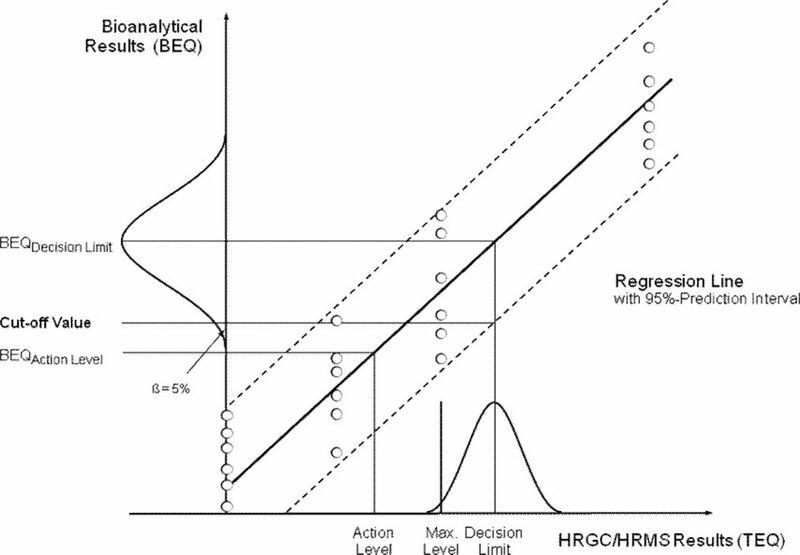 Screening methods compare the analytical result with a cut-off value, providing a yes/no-decision over the possible exceedance of the maximum level or action threshold. The concentration of PCDD/Fs and the sum of PCDD/Fs and dioxin-like PCBs in samples suspected to be non-compliant with the maximum level shall be determined or confirmed by a confirmatory method. In addition, screening methods may give an indication of the levels of PCDD/Fs and dioxin-like PCBs present in the sample. In case of application of bioanalytical screening methods the result is expressed as Bioanalytical Equivalents (BEQ), whereas in case of application of physico-chemical GC-MS methods it is expressed as Toxic Equivalents (TEQ). The numerically indicated results of screening methods are suitable for demonstrating compliance or suspected noncompliance or exceedance of action thresholds and give an indication of the range of levels in case of follow-up by confirmatory methods. They are not suitable for purposes such as evaluation of background levels, estimation of intake, following of time trends in levels or re-evaluation of action thresholds and maximum levels. Confirmatory methods allow the unequivocal identification and quantification of PCDD/Fs and dioxin-like PCBs present in a sample and provide full information on congener level. Therefore, those methods allow the control of maximum levels and action thresholds, including the confirmation of results obtained by screening methods. Furthermore, results may be used for other purposes such as determination of low background levels in feed monitoring, following of time trends, exposure assessment and building of a database for possible re-evaluation of action thresholds and maximum levels. They are also important for establishing congener patterns in order to identify the source of a possible contamination. Such methods utilise GC-HRMS. For confirming compliance or non-compliance with the maximum level, also GC-MS/MS can be used. For calculation of TEQ concentrations, the concentrations of the individual substances in a given sample shall be multiplied by their respective Toxic Equivalency Factor (TEF) (see footnote 1 of Chapter I) and subsequently summed to give the total concentration of dioxin-like compounds expressed as TEQs. For the purposes of this Part B, the accepted specific limit of quantification of an individual congener means the lowest content of the analyte that can be measured with reasonable statistical certainty, fulfilling the identification criteria as described in internationally recognised standards, for example, in standard EN 16215:2012 (Animal feed — Determination of dioxins and dioxin-like PCBs by GC-HRMS and of indicator PCBs by GC-HRMS) and/or in EPA methods 1613 and 1668 as revised. if for technical reasons the signal-to-noise calculation does not provide reliable results, the lowest concentration point on a calibration curve that gives an acceptable (≤ 30 %) and consistent (measured at least at the start and at the end of an analytical series of samples) deviation to the average relative response factor calculated for all points on the calibration curve in each series of samples. The limit of quantification (LOQ) is calculated from the lowest concentration point taking into account the recovery of internal standards and sample intake. Bioanalytical screening methods will not give results at the congener level but merely an indication (10) of the TEQ level, expressed in BEQ to acknowledge the fact that not all compounds present in a sample extract that produce a response in the test may fulfill or meet all requirements of the TEQ-principle. Screening and confirmatory methods may only be applied for control of a certain matrix if the methods are sensitive enough to detect levels reliably at the action threshold or maximum level. 3.1. Measures shall be taken to avoid cross-contamination at each stage of the sampling and analysis procedure. 3.2. The samples shall be stored and transported in glass, aluminum, polypropylene or polyethylene containers suitable for storage without any influence on the levels of PCDD/Fs and dioxin-like PCBs in the samples. Traces of paper dust shall be removed from the sample container. 3.3. The sample storage and transportation shall be performed in a way that maintains the integrity of the feed sample. 3.4. Insofar as relevant, each laboratory sample shall be finely grinded and mixed thoroughly using a process that has been demonstrated to achieve complete homogenisation (for example, ground to pass a 1 mm sieve). Samples shall be dried before grinding if the moisture content is too high. 3.5. Control of reagents, glassware and equipment for possible influence of TEQ- or BEQ-based results shall be carried out. 3.6. A blank analysis shall be performed by carrying out the entire analytical procedure omitting only the sample. 3.7. For bioanalytical methods, all glassware and solvents used in analysis shall be tested to be free of compounds that interfere with the detection of target compounds in the working range. Glassware shall be rinsed with solvents or heated at temperatures suitable to remove traces of PCDD/Fs, dioxin-like compounds and interfering compounds from its surface. 3.8. Sample quantity used for the extraction shall be sufficient to fulfill the requirements with respect to a sufficiently low working range including the concentrations of maximum levels or action threshold. 3.9. The specific sample preparation procedures used for the products under consideration shall follow internationally accepted guidelines. 4.2. Laboratory proficiency shall be proven by the continuous successful participation in inter-laboratory studies for the determination of PCDD/Fs and dioxin-like PCBs in relevant feed matrices and concentration ranges. 4.3. Laboratories applying screening methods for the routine control of samples shall establish a close cooperation with laboratories applying the confirmatory method, both for quality control and confirmation of the analytical result of suspected samples. For PCDD/Fs, detectable quantities shall be in the upper femtogram (10– 15g) range because of extreme toxicity of some of these compounds. For most PCB congeners a limit of quantification in the nanogram (10– 9g) range is already sufficient. For the measurement of the more toxic dioxin-like PCB congeners (in particular non-ortho-substituted congeners), the lower end of the working range shall reach the low picogram (10– 12g) levels. For all other PCB congeners a limit of quantification in the nanogram (10– 9g) range is sufficient. 5.2.1. A distinction is required between PCDD/Fs and dioxin-like PCBs and a multitude of other, coextracted and possibly interfering compounds present at concentrations up to several orders of magnitude higher than those of the analytes of interest. For GC-MS methods, a differentiation among various congeners is required, such as between toxic (for example, the seventeen 2,3,7,8-substituted PCDD/Fs, and twelve dioxin-like PCBs) and other congeners. 5.2.2. Bioanalytical methods shall be able to detect the target compounds as the sum of PCDD/Fs, and/or dioxin-like PCBs. Sample clean-up shall aim at removing compounds causing false non-compliant results or compounds that may decrease the response, causing false compliant results. 5.3.1. For GC-MS methods, the determination shall provide a valid estimate of the true concentration in a sample. High accuracy is required to avoid the rejection of a sample analysis result on the basis of poor reliability of the determined TEQ level. Accuracy is expressed as trueness (difference between the mean value measured for an analyte in a certified material and its certified value, expressed as a percentage of this value) and precision (RSDR relative standard deviation calculated from results generated under reproducibility conditions). 5.3.2. For bioanalytical methods, the bioassay apparent recovery shall be determined. Bioassay apparent recovery means the BEQ level calculated from the TCDD or PCB 126 calibration curve corrected for the blank and then divided by the TEQ level determined by the confirmatory method. It aims at correcting factors like the loss of PCDD/Fs and dioxin-like compounds during the extraction and clean-up steps, co-extracted compounds increasing or decreasing the response (agonistic and antagonistic effects), the quality of the curve fit, or differences between the TEF values and the Relative Potency (REP) values. The bioassay apparent recovery is calculated from suitable reference samples with representative congener patterns around the level of interest. 5.4.1. Laboratories shall demonstrate the performance of a method in the range of the maximum level, for example, 0,5x, 1x and 2x the maximum level with an acceptable coefficient of variation for repeated analysis, during the validation procedure and during routine analysis. 5.4.2. Regular blank controls and spiking experiments or analysis of control samples (preferably, if available, certified reference material) shall be performed as internal quality control measures. Quality control charts for blank controls, spiking experiments or analysis of control samples shall be recorded and checked to make sure the analytical performance is in accordance with the requirements. 5.5.1. For a bioanalytical screening method, the establishment of the limit of quantification (LOQ) is not an indispensable requirement but the method shall prove that it can differentiate between the blank and the cut-off value. When providing a BEQ level, a reporting level shall be established to deal with samples showing a response below this level. The reporting level shall be demonstrated to be different from procedure blank samples at least by a factor of three, with a response below the working range. It shall therefore be calculated from samples containing the target compounds around the required minimum level, and not from an S/N ratio or an assay blank. 5.5.2. The LOQ for a confirmatory method shall be about one fifth of the maximum level. 5.7.1. Both GC-MS and bioanalytical methods may be used for screening. For GC-MS methods the requirements laid down in point 6 shall be met. For cell based bioanalytical methods specific requirements are laid down in point 7. 5.7.2. Laboratories applying screening methods for the routine control of samples shall establish a close cooperation with laboratories applying the confirmatory method. 5.7.3. Performance verification of the screening method is required during routine analysis, by analytical quality control and on-going method validation. There shall be a continuous programme for the control of compliant results. 20 % of the sample extracts shall be measured in routine screening without and with 2,3,7,8-TCDD added corresponding to the maximum level or action threshold, to check if the response is possibly suppressed by interfering substances present in the sample extract. The measured concentration of the spiked sample shall be compared to the sum of the concentration of the unspiked extract plus the spiking concentration. If this measured concentration is more than 25 % lower than the calculated (sum) concentration, this is an indication of potential signal suppression and the respective sample shall be submitted to GC-HRMS confirmatory analysis. Results shall be monitored in quality control charts. Approximately 2 to 10 % of the compliant samples, depending on sample matrix and laboratory experience, shall be confirmed by GC/HRMS. The rate of false-compliant results from screening of samples below and above the maximum level or the action threshold shall be determined. Actual false-compliant rates shall be below 5 %. When a minimum of 20 confirmed results per matrix/matrix group is available from the quality control of compliant samples, conclusions on the false compliant rate shall be drawn from this database. The results from samples analysed in ring trials or during contamination incidents, covering a concentration range up to for example 2x the maximum level (ML), may also be included in the minimum of 20 results for evaluation of the false-compliant rate. The samples shall cover most frequent congener patterns, representing various sources. Although screening assays shall preferentially aim to detect samples exceeding the action threshold, the criterion for determining false-compliant rates is the maximum level, taking into account the expanded measurement uncertainty of the confirmatory method. 5.7.7. Potential non-compliant samples from screening shall always be verified by a full re-analysis of the original sample by a confirmatory method of analysis. These samples may also be used to evaluate the rate of false non-compliant results. For screening methods, the rate of false non-compliant results shall be the fraction of results confirmed to be compliant from confirmatory analysis, while in previous screening the sample has been declared to be potentially non-compliant. Evaluation of the advantages of the screening method shall be based on comparison of false-non-compliant samples with the total number of samples checked. This rate shall be low enough to make the use of a screening tool advantageous. 5.7.8. Under validation conditions, bioanalytical methods shall provide a valid indication of the TEQ level, calculated and expressed as BEQ. The difference between upper-bound level and lower-bound level shall not exceed 20 % for confirmation of exceedance of maximum level or in case of need of action thresholds. 6.2.1. Addition of 13C-labelled 2,3,7,8-chlorine-substituted internal PCDD/F standards and of 13C-labelled internal dioxin-like PCB standards shall be carried out at the very beginning of the analytical method e.g. prior to extraction in order to validate the analytical procedure. At least one congener for each of the tetra- to octa-chlorinated homologous groups for PCDD/Fs and at least one congener for each of the homologous groups for dioxin-like PCBs shall be added (alternatively, at least one congener for each mass spectrometric selected ion recording function used for monitoring PCDD/Fs and dioxin-like PCBs). In the case of confirmatory methods, all 17 13C-labelled 2,3,7,8-substituted internal PCDD/F standards and all 12 13C-labelled internal dioxin-like PCB standards shall be used. 6.2.2. Relative response factors shall also be determined for those congeners for which no 13C-labelled analogue is added by using appropriate calibration solutions. 6.2.3. For feed of plant origin and feed of animal origin containing less than 10 % fat, the addition of the internal standards shall be mandatory prior to extraction. For feed of animal origin containing more than 10 % fat, the internal standards shall be added either before or after fat extraction. An appropriate validation of the extraction efficiency shall be carried out, depending on the stage at which internal standards are introduced. 6.2.4. Prior to GC-MS analysis, 1 or 2 recovery (surrogate) standard(s) shall be added. 6.2.5. Control of recovery is required. For confirmatory methods, the recoveries of the individual internal standards shall be in the range of 60 to 120 %. Lower or higher recoveries for individual congeners, in particular for some hepta- and octa- chlorinated dibenzo-p-dioxins and dibenzofurans, shall be acceptable on the condition that their contribution to the TEQ value does not exceed 10 % of the total TEQ value (based on sum of PCDD/F and dioxin-like PCBs). For GC-MS screening methods, the recoveries shall be in the range of 30 to 140 %. Separation of PCDD/Fs from interfering chlorinated compounds such as non-dioxin-like PCBs and chlorinated diphenyl ethers shall be carried out by suitable chromatographic techniques (preferably with a florisil, alumina and/or carbon column). Gas-chromatographic separation of isomers shall be < 25 % peak to peak between 1,2,3,4,7,8-HxCDF and 1,2,3,6,7,8-HxCDF. The range of the calibration curve shall cover the relevant range of maximum level or action thresholds. In HRMS, the resolution shall typically be greater than or equal to 10 000 for the entire mass range at 10 % valley. Fulfilment of further identification and confirmation criteria as described in internationally recognised standards, for example, in standard EN 16215:2012 (Animal feed — Determination of dioxins and dioxin-like PCBs by GC-HRMS and of indicator PCBs by GC-HRMS) and/or in EPA methods 1613 and 1668 as revised. Monitoring of at least 2 specific precursor ions, each with one specific corresponding transition product ion for all labelled and unlabelled analytes in the scope of analysis. Maximum permitted tolerance of relative ion intensities of ± 15 % for selected transition product ions in comparison to calculated or measured values (average from calibration standards), applying identical MS/MS conditions, in particular collision energy and collision gas pressure, for each transition of an analyte. Resolution for each quadrupole to be set equal to or better than unit mass resolution (unit mass resolution: sufficient resolution to separate two peaks one mass unit apart) in order to minimise possible interferences on the analytes of interest. Fulfilment of the further criteria as described in internationally recognised standards, for example, in standard EN 16215:2012 (Animal feed — Determination of dioxins and dioxin-like PCBs by GC-HRMS and of indicator PCBs by GC-HRMS) and/or in EPA methods 1613 and 1668 as revised, except the obligation to use GC-HRMS. Bioanalytical methods are methods based on the use of biological principles like cell-based assays, receptor-assays or immunoassays. This point 7 establishes requirements for bioanalytical methods in general. A screening method in principle classifies a sample as compliant or suspected to be non-compliant. For this, the calculated BEQ level is compared to the cut-off value (see point 7.3). Samples below the cut-off value are declared compliant, samples equal or above the cut-off value are suspected to be non-compliant, requiring analysis by a confirmatory method. In practice, a BEQ level corresponding to two-thirds of the maximum level may serve as cut-off value provided that a false-compliant rate below 5 % and an acceptable rate for false non-compliant results are ensured. With separate maximum levels for PCDD/Fs and for the sum of PCDD/Fs and dioxin-like PCBs, checking compliance of samples without fractionation requires appropriate bioassay cut-off values for PCDD/Fs. For checking of samples exceeding the action thresholds, an appropriate percentage of the respective action threshold shall suit as cut-off value. If an indicative level is expressed in BEQs, sample results shall be in the working range and shall exceed the reporting limit (see points 7.1.1 and 7.1.6). When calculating the concentrations from a TCDD calibration curve, values at the higher end of the curve will show a high variation (high coefficient of variation (CV)). The working range is the area where this CV is smaller than 15 %. The lower end of the working range (reporting limit) shall be set at least by a factor of three above the procedure blanks. The upper end of the working range is usually represented by the EC70 value (70 % of maximal effective concentration), but lower if the CV is higher than 15 % in this range. The working range shall be established during validation. Cut-off values (see point 7.3) shall be well within the working range. Standard solutions and sample extracts shall be tested in triplicate or at least in duplicate. When using duplicates, a standard solution or a control extract tested in four to six wells divided over the plate shall produce a response or concentration (only possible in the working range) based on a CV < 15 %. Levels in samples shall be estimated by comparison of the test response with a calibration curve of TCDD (or PCB 126 or a PCDD/PCDF/dioxin-like PCB standard mixture) to calculate the BEQ level in the extract and subsequently in the sample. Calibration curves shall contain 8 to 12 concentrations (at least in duplicates), with enough concentrations in the lower part of the curve (working range). Special attention shall be paid to the quality of the curve-fit in the working range. As such, the R2 value is of little or no value in estimating the goodness of fit in non-linear regression. A better fit shall be achieved by minimising the difference between calculated and observed levels in the working range of the curve, for example by minimising the sum of squared residuals. The estimated level in the sample extract shall be subsequently corrected for the BEQ level calculated for a matrix or solvent blank sample (to account for impurities from solvents and chemicals used), and the apparent recovery (calculated from the BEQ level of suitable reference samples with representative congener patterns around the maximum level or action threshold). To perform a recovery correction, the apparent recovery shall be within the required range (see point 7.1.4). Reference samples used for recovery correction shall comply with the requirements laid down in point 7.2. Alternatively, a calibration curve prepared from at least four reference samples (see point 7.2.4): one matrix blank, plus three reference samples at 0,5x, 1x and 2x the maximum level or action threshold may be used, eliminating the need to correct for blank and recovery if matrix properties of the reference samples match those of the unknown samples. In this case, the test response corresponding to two-thirds of the maximum level (see point 7.3) may be calculated directly from these samples and used as cut-off value. For checking of samples exceeding the action thresholds, an appropriate percentage of these action thresholds shall suit as cut-off value. Extracts may be split into fractions containing PCDD/Fs and dioxin-like PCBs, allowing a separate indication of PCDD/Fs and dioxin-like PCB TEQ levels (in BEQ). A PCB 126 standard calibration curve shall preferentially be used to evaluate results for the fraction containing dioxin-like PCBs. The “bioassay apparent recovery” shall be calculated from suitable reference samples with representative congener patterns around the maximum level or action threshold and expressed as percentage of the BEQ level in comparison to the TEQ level. Depending on the type of assay and TEFs (12) used, the differences between TEF and REP factors for dioxin-like PCBs can cause low apparent recoveries for dioxin-like PCBs in comparison to PCDD/Fs. Therefore, if a separate determination of PCDD/Fs and dioxin-like PCBs is performed, bioassay apparent recoveries shall be: for dioxin-like PCBs 20 % to 60 %, for PCDD/Fs 50 % to 130 % (ranges apply for the TCDD calibration curve). As the contribution of dioxin-like PCBs to the sum of PCDD/Fs and dioxin-like PCBs can vary between different matrices and samples, bioassay apparent recoveries for the sum of PCDD/Fs and dioxin-like PCBs reflect these ranges and shall be between 30 % and 130 %. Any implication of substantially revised TEF values for the Union legislation for PCDD/Fs and dioxin-like PCBs requires the revision of these ranges. The loss of compounds during the clean-up shall be checked during validation. A blank sample spiked with a mixture of the different congeners shall be submitted to clean-up (at least n = 3) and the recovery and variability checked by a confirmatory method. The recovery shall be within 60 % to 120 % especially for congeners contributing more than 10 % to the TEQ-level in various mixtures. When reporting BEQ levels, a reporting limit shall be determined from relevant matrix samples involving typical congener patterns, but not from the calibration curve of the standards due to low precision in the lower range of the curve. Effects from extraction and clean-up shall be taken into account. The reporting limit shall be set at least by a factor of three above the procedure blanks. 7.2.1. Reference samples shall represent sample matrix, congener patterns and concentration ranges for PCDD/Fs and dioxin-like PCBs around the maximum level or action threshold. 7.2.2. A matrix blank, and where it is not possible, a procedure blank, and a reference sample at the maximum level or action threshold shall be included in each test series. These samples shall be extracted and tested at the same time under identical conditions. The reference sample shall show a clearly elevated response in comparison to the blank sample, thus ensuring the suitability of the test. Those samples may be used for blank and recovery corrections. 7.2.3. Reference samples chosen to perform a recovery correction shall be representative for the test samples, meaning that congener patterns may not lead to an underestimation of levels. 7.2.4. Extra reference samples at e.g. 0,5x and 2x the maximum level or action threshold may be included to demonstrate the proper performance of the test in the range of interest for the control of the maximum level or action threshold. Combined, these samples may be used for calculating the BEQ levels in test samples (see point 7.1.2.2). The relationship between bioanalytical results in BEQ and results from the confirmatory method in TEQ shall be established, for example by matrix-matched calibration experiments, involving reference samples spiked at 0, 0,5x, 1x and 2x the ML, with 6 repetitions on each level (n = 24). Correction factors (blank and recovery) may be estimated from this relationship but shall be checked in accordance with point 7.2.2. Cut-off values shall be established for decisions over sample compliance with maximum levels or for the control of action thresholds, if relevant, with the respective maximum levels or action threshold set for either PCDD/Fs and dioxin-like PCBs alone, or for the sum of PCDD/Fs and dioxin-like PCBs. They are represented by the lower end-point of the distribution of bioanalytical results (corrected for blank and recovery) corresponding to the decision limit of the confirmatory method based on a 95 % level of confidence, implying a false-compliant rate < 5 %, and on a RSDR < 25 %. The decision limit of the confirmatory method is the maximum level, taking into account the expanded measurement uncertainty. The cut-off value (in BEQ) may be calculated in accordance with one of the approaches set out in points 7.3.1, 7.3.2 and 7.3.3. (see Figure 1). from the lower band of the 95 % prediction interval at the decision limit of the confirmatory method. from multiple analysis of samples (n ≥ 6) contaminated at the decision limit of the confirmatory method as the lower end-point of the data distribution (represented in the figure by a bell-shaped curve) at the corresponding mean BEQ value. BEQ-based cut-off values calculated from the RSDR achieved during validation using a limited number of samples with different matrix/congener patterns may be higher than the TEQ-based maximum levels or action thresholds due to a better precision than attainable in routine when an unknown spectrum of possible congener patterns has to be controlled. In such cases, cut-off values shall be calculated from an RSDR = 25 %, or two-thirds of the maximum level or action threshold shall be preferred. 7.4.1. Since no internal standards can be used in bioanalytical methods, tests on the repeatability of bioanalytical methods shall be carried out to obtain information on the standard deviation within and between test series. Repeatability shall be below 20 % and intra-laboratory reproducibility shall be below 25 %. This shall be based on the calculated levels in BEQ after blank and recovery correction. 7.4.2. As part of the validation process, the test shall be shown to discriminate between a blank sample and a level at the cut-off value, allowing the identification of samples above the corresponding cut-off value (see point 7.1.2). 7.4.3. Target compounds, possible interferences and maximum tolerable blank levels shall be defined. 7.4.4. The percent standard deviation in the response or concentration calculated from the response (only possible in working range) of a triplicate determination of a sample extract may not be above 15 %. 7.4.5. The uncorrected results of the reference sample(s) expressed in BEQ (blank and at the maximum level or action threshold) shall be used for evaluation of the performance of the bioanalytical method over a constant time period. 7.4.6. Quality control charts for procedure blanks and each type of reference sample shall be recorded and checked to make sure the analytical performance is in accordance with the requirements, in particular for the procedure blanks with regard to the requested minimum difference to the lower end of the working range and for the reference samples with regard to within-laboratory reproducibility. Procedure blanks shall be controlled in a manner to avoid false-compliant results when subtracted. 7.4.7. The results from the confirmatory methods of suspected samples and 2 to 10 % of the compliant samples (minimum of 20 samples per matrix) shall be collected and used to evaluate the performance of the screening method and the relationship between BEQ and TEQ. This database may be used for the re-evaluation of cut-off values applicable to routine samples for the validated matrices. 7.4.8. Successful method performance may also be demonstrated by participation in ring trials. The results from samples analysed in ring trials, covering a concentration range up to e.g. 2 × maximum level, may be included in the evaluation of the false-compliant rate, if a laboratory is able to demonstrate its successful performance. The samples shall cover most frequent congener patterns, representing various sources. 7.4.9. During incidents, the cut-off values may be re-evaluated, reflecting the specific matrix and congener patterns of this single incident. 8.1.1. The analytical results shall contain the levels of the individual PCDD/F and dioxin-like PCB congeners and TEQ-values shall be reported as lower-bound, upper-bound and medium-bound in order to include a maximum of information in the reporting of the results and thereby enabling the interpretation of the results according to specific requirements. 8.1.2. The report shall include the method used for extraction of PCDD/Fs and dioxin-like PCBs. 8.1.3. The recoveries of the individual internal standards shall be made available in case the recoveries are outside the range referred to in point 6.2.5, in case the maximum level is exceeded (in this case, the recoveries for one of the two duplicate analysis) and in other cases upon request. 8.1.4. As the expanded measurement uncertainty is to be taken into account when deciding about the compliance of a sample, this parameter shall be made available. Thus, analytical results shall be reported as x +/– U whereby x is the analytical result and U is the expanded measurement uncertainty using a coverage factor of 2 which gives a level of confidence of approximately 95 %. In the case of a separate determination of PCDD/Fs and dioxin-like-PCBs, the sum of the estimated expanded uncertainty of the separate analytical results of PCDD/Fs and dioxin-like PCBs shall be used for the sum of PCDD/Fs and dioxin-like PCBs. 8.2.1. The result of the screening shall be expressed as “compliant” or “suspected to be non-compliant” (“suspected”). 8.2.2. In addition, an indicative result for PCDD/Fs and/or dioxin-like PCBs expressed in BEQ, and not TEQ, may be given. 8.2.3. Samples with a response below the reporting limit shall be expressed as “lower than the reporting limit”. Samples with a response above the working range shall be reported as “exceeding the working range” and the level corresponding to the upper end of the working range shall be given in BEQ. 8.2.4. For each type of sample matrix, the report shall mention the maximum level or action threshold on which the evaluation is based. 8.2.5. The report shall mention the type of the test applied, the basic test principle and the kind of calibration. 8.2.6. The report shall include the method used for extraction of PCDD/Fs and dioxin-like PCBs. 8.2.7. In case of samples suspected to be non-compliant, the report needs to include a note on the action to be taken. The concentration of PCDD/Fs and the sum of PCDD/Fs and dioxin-like PCBs in those samples with elevated levels has to be determined/confirmed by a confirmatory method. 8.2.8. Non-compliant results shall only be reported from confirmatory analysis. 8.3.1. The result of the screening shall be expressed as “compliant” or “suspected to be non-compliant” (“suspected”). 8.3.2. For each type of sample matrix, the report shall mention the maximum level or action threshold on which the evaluation is based. 8.3.3. In addition, levels for individual PCDD/F and/or dioxin-like PCB congeners and TEQ-values reported as lower-bound, upper-bound and medium-bound may be given. The results shall be expressed in the same units and with at least the same number of significant figures as the maximum levels laid down by Directive 2002/32/EC. 8.3.4. The recoveries of the individual internal standards shall be made available in case the recoveries are outside the range referred to in point 6.2.5, in case the maximum level is exceeded (in this case, the recoveries for one of the two duplicate analysis) and in other cases upon request. 8.3.5. The report shall mention the GC-MS method applied. 8.3.6. The report shall include the method used for extraction of PCDD/Fs and dioxin-like PCBs. 8.3.7. In case of samples suspected to be non-compliant, the report needs to include a note on the action to be taken. The concentration of PCDD/Fs and the sum of PCDD/Fs and dioxin-like PCBs in those samples with elevated levels has to be determined/confirmed by a confirmatory method. 8.3.8. Non-compliance can only be decided after confirmatory analysis. The requirements set out in this Chapter shall be applied where feed is analysed for the official control of the levels of non-dioxin-like PCBs and as regards sample preparation and analytical requirements for other regulatory purposes, which includes the controls performed by the feed business operator to ensure compliance with the provisions of Regulation (EC) No 183/2005. Gas chromatography/Electron Capture Detection (GC-ECD), GC-LRMS, GC-MS/MS, GC-HRMS or equivalent methods. 3.1. Relative retention time in relation to internal standards or reference standards (acceptable deviation of +/– 0,25 %). 3.2. Gas chromatographic separation of the non-dioxin-like PCBs from interfering substances, especially co-eluting PCBs, in particular if levels of samples are in the range of legal limits and non-compliance is to be confirmed (13). two specific precursor ions, each with one specific corresponding transition product ion for for MS-MS. Results exceeding the maximum level shall be confirmed with two GC columns with stationary phases of different polarity. The performance of the method shall be validated in the range of the maximum level (0,5 to 2 times the maximum level) with an acceptable coefficient of variation for repeated analysis (see requirements for intermediate precision in point (9). The sum of the LOQs (14) of non-dioxin-like PCBs shall not be higher than one-third of the maximum level (15). Regular blank controls, analysis of spiked samples, quality control samples, participation in inter-laboratory studies on relevant matrices. 7.1. Suitable internal standards with physico-chemical properties comparable to analytes of interest shall be used. Addition to products (before extraction and clean-up process). lower or higher recoveries for individual congeners with a contribution to the sum of non-dioxin-like PCBs below 10 % are acceptable. results shall be corrected for recoveries of internal standards. 7.5. The recoveries of unlabelled congeners shall be checked by spiked samples or quality control samples with concentrations in the range of the maximum level. Recoveries for these congeners shall be considered acceptable, if they are between 60 and 120 %. In accordance with the provisions of Regulation (EC) No 882/2004, laboratories shall be accredited by a recognised body operating in accordance with ISO Guide 58 to ensure that they are applying analytical quality assurance. Laboratories shall be accredited following the EN ISO/IEC 17025 standard. In addition, the principles as described in Technical Guidelines for the estimation of measurement uncertainty and limits of quantification for PCB analysis shall be followed when applicable (16). 10.1. The analytical results shall contain the levels of the individual non-dioxin-like PCBs and the sum of those PCB congenersreported as lower-bound, upper-bound and medium-bound in order to include a maximum of information in the reporting of the results and thereby enabling the interpretation of the results according to specific requirements. 10.2. The report shall include the method used for the extraction of PCBs. 10.3. The recoveries of the individual internal standards shall be made available in case the recoveries are outside the range referred to in point 7, in case the maximum level is exceeded and in other cases upon request. 10.4. As the expanded measurement uncertainty is to be taken into account when deciding about the compliance of a sample, that parameter shall also be made available. Thus, analytical results shall be reported as x +/– U whereby x is the analytical result and U is the expanded measurement uncertainty using a coverage factor of 2 which gives a level of confidence of approximately 95 %. (1) Table of TEF (= toxic equivalency factors) for PCDDs, PCDFs and dioxin-like PCBs: WHO-TEFs for human risk assessment based on the conclusions of the World Health Organization (WHO) — International Programme on Chemical Safety (IPCS) expert meeting which was held in Geneva in June 2005 (Martin van den Berg et al., The 2005 World Health Organization Re-evaluation of Human and Mammalian Toxic Equivalency Factors for Dioxins and Dioxin-like Compounds. Toxicological Sciences 93(2), 223–241 (2006)). Abbreviations used: “T” = tetra; “Pe” = penta; “Hx” = hexa; “Hp” = hepta; “O” = octa; “CDD” = chlorodibenzodioxin; “CDF” = chlorodibenzofuran; “CB” = chlorobiphenyl. (2) Commission Decision 2002/657/EC of 14 August 2002 implementing Council Directive 96/23/EC concerning the performance of analytical methods and interpretation of results (OJ L 221, 17.8.2002, p. 8). (3) The principles described in the “Guidance Document on Measurement Uncertainty for Laboratories performing PCDD/F and PCB Analysis using Isotope Dilution Mass Spectrometry” (http://ec.europa.eu/food/safety/animal-feed_en) shall be followed when applicable. (4) The concept of “upper-bound” requires using the limit of quantification for the contribution of each non-quantified congener. The concept of “lower-bound” requires using zero for the contribution of each non-quantified congener. The concept of “medium-bound” requires using half of the limit of quantification calculating the contribution of each non-quantified congener. (5) Duplicate analysis: Separate analysis of the analytes of interest using a second aliquot of the same homogenized sample. In general, the requirements for duplicate analysis as provided for in Annex II, Chapter C, point 3 apply. However, for methods with the use of 13C-labelled internal standard for the relevant analytes, the duplicate analysis is only necessary if the result of the first determination is not compliant. The duplicate analysis is necessary to exclude the possibility of internal cross-contamination or an accidental mix-up of samples. In case the analysis is performed in the course of a contamination incident, confirmation by duplicate analysis may be omitted in case the samples selected for analysis are through traceability linked to the contamination incident and the level found is significantly above the maximum level. (6) The concept of “upper-bound” requires using the limit of quantification for the contribution of each non-quantified congener to the Toxic Equivalent (TEQ). The concept of “lower-bound” requires using zero for the contribution of each non-quantified congener to the TEQ. The concept of “medium-bound” requires using half of the limit of quantification calculating the contribution of each non-quantified congener to the TEQ. (7) In general, the requirements for duplicate analysis as provided for in Annex II, Chapter C, point 2 apply. However, for confirmatory methods with the use of 13C-labelled internal standard for the relevant analytes, the duplicate analysis is only necessary if the result of the first determination is not compliant. The duplicate analysis is necessary to exclude the possibility of internal cross-contamination or an accidental mix-up of samples. In case the analysis is performed in the course of a contamination incident, confirmation by duplicate analysis may be omitted in case the samples selected for analysis are through traceability linked to the contamination incident and the level found is significantly above the maximum level. (8) Identical explanation and requirements for duplicate analysis for control of action thresholds as in footnote 2 above for maximum levels. (9) Regulation (EC) No 183/2005 of the European Parliament and of the Council of 12 January 2005 laying down requirements for feed hygiene (OJ L 35, 8.2.2005, p. 1). (10) Bioanalytical methods are not specific to those congeners included in the TEF-scheme. Other structurally related AhR-active compounds may be present in the sample extract which contribute to the overall response. Therefore, bioanalytical results cannot be an estimate but rather an indication of the TEQ level in the sample. (11) “Guidance Document on Measurement Uncertainty for Laboratories performing PCDD/F and PCB Analysis using Isotope Dilution Mass Spectrometry” (http://ec.europa.eu/food/safety/animal-feed_en), “Guidance Document on the Estimation of LOD and LOQ for Measurements in the Field of Contaminants in Feed and Food” (http://ec.europa.eu/food/safety/animal-feed_en). (*1) With respect to the maximum levels. (12) Current requirements are based on the TEFs published in: M. Van den Berg et al, Toxicol Sci 93 (2), 223–241 (2006). (13) Congeners often found to co-elute are for example PCB 28/31, PCB 52/69 and PCB 138/163/164. For GC-MS also possible interferences from fragments of higher chlorinated congeners shall be considered. (14) The principles as described in the “Guidance Document on the Estimation of LOD and LOQ for Measurements in the Field of Contaminants in Feed and Food” (http://ec.europa.eu/food/safety/animal-feed_en) shall be followed when applicable. (15) It is highly recommendable to have a lower contribution of the reagent blank level to the level of a contaminant in a sample. It is in the responsibility of the laboratory to control the variation of blank levels, in particular, if the blank levels are subtracted. (16) Current requirements are based on the TEFs published in: M. Van den Berg et al, Toxicol Sci 93(2), 223–241 (2006). (17) Use of all six 13C-labelled analogues as internal standards required.